Together with The Baroque Book (97479), this book was compiled as part of an educational series implementing an innovative teaching concept developed by the UK branch of the European Guitar Teachers Association. 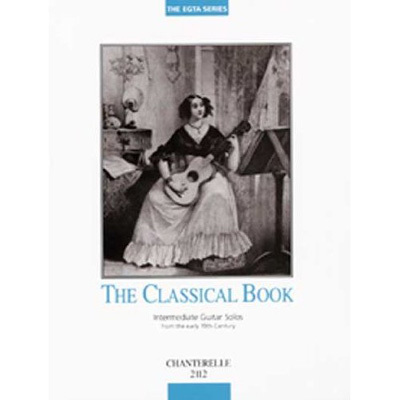 This volume contains intermediate level classic guitar solos from the early 19th Century, including works by Aguado, Carcassi, Carulli, Coste, Diabelli, Giuliani, Molino, and Sor. The progressively arranged pieces are divided into three categories: 1) pieces that do not contain left-hand slurs or barres and do not go higher than the fifth position, 2) pieces that include half barres, single grace notes, and other examples of the left-hand slur, and 3) pieces that include full barres along with multiple grace notes. Higher positions are required with greater frequency in the latter two sections. Overall, this anthology provides great sight reading practice at an intermediate level, along with ample historical and biographical notes.